Www.utm.my innovative ● entrepreneurial ● global 1 Update on University KAIs/KPIs 26 Dec. 2012 Office of Corporate Affairs. 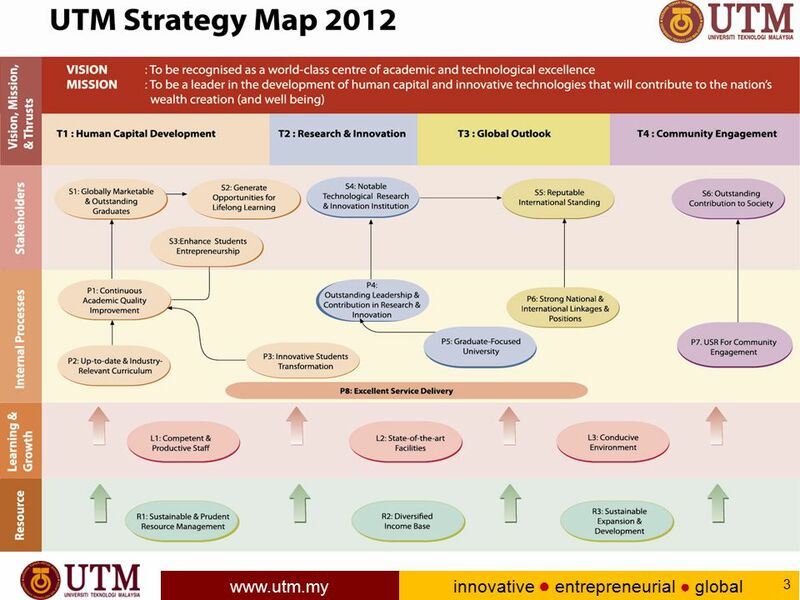 Download ppt "Www.utm.my innovative ● entrepreneurial ● global 1 Update on University KAIs/KPIs 26 Dec. 2012 Office of Corporate Affairs." Presented by: Jerry Legge Associate Provost for Academic Planning (Interim), and Professor of Public Administration and Policy (SPIA) Provost Advisory. Teaching and Learning Strategy Day Teaching and Learning Strategy Day Professor Wendy Purcell Vice-Chancellor and Chief Executive University of Plymouth. Strategic Plan: Status Update 2014 Annual Faculty Conference Terry Parker, Provost. The Role of the National Authority for Quality Assurance and Accreditation (NAQAAE) in Egyptian Education The National Authority for Quality Assurance. FY Strategic Plan Overview Barbara D. Boyan, Ph.D. Dean Spring 2013. Annual Staff Development Conference Investing in ourselves- investing in the future of our university community Julian Crampton Vice-Chancellor 1 May 2008. INDUSTRIAL DOCTORATE Presented by: School of Graduate Studies Universiti Teknologi Malaysia. College Strategic Plan by Strategic Planning and Quality Assurance Committee. IEEE President-Elect Forum Philadelphia Section June 24, 2003 CONGRATULATIONS TO THE PHILADELPHIA SECTION ON ITS FIRST CENTENNIAL ANNIVERSARY !